Recent reports showed that breast implants are not completely safe. In 2011, the FDA (Food and Drug Administration) reported a possible association between the breast implants and the development of certain type of cancers of the lymphatic system called Anaplastic Large Cell Lymphoma. First, what are the materials used for breast implants? There are two major sources for breast implants, the silicone (which may be either Silicone fluid (polydimethylsiloxane, PDMS), Silicone gel, or Silicone Elastomer), or a saline implant. The idea from implants (either Silicone or Saline) is to fill the normal breast tissue with a material that creates the shape/contour of the normal breast. Over decades, Silicone implants were condemned with many side effects such as the development of skin allergies, breast tissue contracture, breast pain, disfigurement of the implanted breast, and development of foreign body reaction and maybe rejection ( British Medical Journal 2018 https://bmjopen.bmj.com/content/8/4/e020671 ). However, the new findings by the FDA about the correlation between the breast implants (especially the silicone types) and the Lymphoma is the first of its kind. Another high profile research institute in Australia and New Zealand recently published research on the new phenomenon of development of Anaplastic Large Cell Lymphoma for patients who had breast implants. In their research article published in 2017 (Loch-Wilkinson A et al 2017) in the Plastic and Reconstructive Surgery Journal https://insights.ovid.com/pubmed?pmid=28481803 55 patients with breast implants developed Anaplastic Large Cell Lymphoma between 2007 and 2016 and four patients died of the disease during this time period. 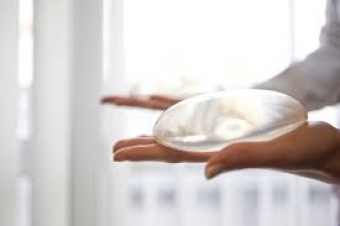 The FDA recommends that physicians be proactive when patients with breast implants develop one or more of these symptoms: late onset and persistent seroma (fluid collection around the implant), persistent breast pain and swelling. The doctors need to do more workup and investigate for possible development of ALCL. Also making patients aware of the breast implant manufacturer’s labelling as some of the implants ( especially the textured surface implants) were found to be linked to the risk of development of lymphoma. Also, any suspicious mass/swelling should alert the treating physician to take a biopsy from this lump and look for the possibility of having ALCL. Additionally, teaching patients the different types of implants, their pros and cons are of paramount importance to guide them through the best choice for them and to avoid any possible late effects.